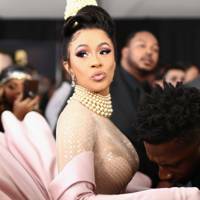 You can always rely on Cardi B to make an entrance, and her arrival at the 61st Annual Grammy Awards on Sunday night was no exception. Channelling her best oyster shell realness, the Bronx queen kept the bold fashion choices coming with a black fishtail velvet gown complete with fluted pink panels and a pearl crown that ensured she turned heads on the red carpet. Sharp-eyed fans were quick to point out that the show-stopping look was inspired by vintage Thierry Mugler couture from Fall 1995. WE DO NOT DESERVE THIS GODDESS.